Our new buses are hitting the road! 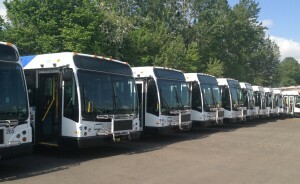 The first few buses of the 3200 fleet being prepped for TriMet service. Riders along TriMet’s bus line 70 have noticed a new ride this morning. The first two of 60 new TriMet buses began serving customers. Riders will continue to see new buses, referred to as the 3200-series, added to the fleet each week throughout the summer. The 3200s are quite similar to the 70 new 3100-series buses delivered last year. The one big change riders will notice is a new exterior light above the back door. This “porch light” was added to help riders navigate safely off the vehicle at night. The new buses also received some ergonomic improvements for operators, including moving some frequently used switches and decreasing the size of the steering wheel. Like the 3100s, these new buses are more fuel and emissions efficient, and they offer a smoother ride. They come with air conditioning, automatic stop announcements, easy-to-clean vinyl seats and interior surfaces with an anti-microbial finish, larger windows, low floors, handrails and a gently sloping floor at the rear exit, a next-generation GPS dispatch/tracking system and improved windshield visibility for operators. McFarlane noted that 64 more new buses are on order and will be delivered by the end of Fiscal Year 2015 (June 30, 2015). By the end of the summer, roughly a quarter of the fleet will be upgraded with new vehicles. Bus replacement had been suspended during the recession to focus resources on retaining as much service as possible. One bus a day will come off the Gillig assembly line in Hayward, CA. Roughly three to five buses will be delivered per week throughout the summer. After taking delivery of the new vehicles, it takes TriMet about two weeks to get them service ready including DMV title, license and registration. The new 3200-series buses cost $422,921each and are slated to be distributed between two TriMet garages, Merlo Garage in Beaverton and Center Street Garage in southeast Portland. TriMet will begin to replace fleet vehicles that are highest on the retirement priority list. Summer: 58 additional 3200-series buses will be delivered and put into service. Fall: 30 3300-series buses will begin to arrive. – 22 30-foot buses will be delivered —replacing 22 30-foot buses TriMet purchased in 1992. These 30-foot vehicles operate on lines where the terrain cannot accommodate the larger buses. – 8 40-foot diesel buses will arrive. Mid-2015: 4 hybrid buses will be delivered. In addition to the new bus purchases, TriMet will invest $3.6 million this fiscal year to increase the frequency of popular bus lines and all MAX lines. Riders will have 15 minute or better service later into the evening on weekdays. The 12 Frequent Service bus lines with improved evening service will be: 4, 6, 8, 9, 12, 14, 15, 33, 54/56, 57 and 75. Line 72 already has 15 minute service until 9 p.m. Frequent Service lines carry about 55 percent of all riders, making them the workhorses of the bus network. The MAX Green Line will have 15 minute or better service into the evening hours, matching the current service on the Blue, Red and Yellow lines. More buses will be added to 12 lines to relieve overcrowding and make trips more comfortable for riders: Lines 4, 8, 9, 10, 15, 20, 33, 44, 76, 85, 94 and 99. TriMet will adjust schedules on three lines to give them more predictable arrival times: Line 71 will see improvements this summer with Lines 20 and 72 improvements coming later in the budget year. TriMet is hiring new bus operators to meet growing service expansions, including the opening of the Portland-Milwaukie Light Rail Transit Project, and to provide the service improvements listed above. If you are interested please visit: trimet.org/careers.